Katano-kamoike and an observatory in winter ©1998 K. Miyashita. The Lake is a famous site for a traditional method of catching duck by throwing nets, called as "Saka'amiryo" in Japanese. 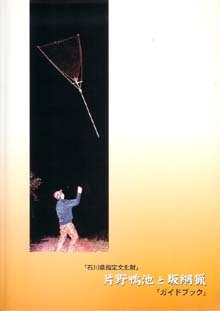 Guidebook on Katano-kamoike and "Saka'amiryo", Katano-Kamoike Saka'amiryo Hozon-kai, 2001, in Japanese. Katano-kamoike is a permanent freshwater lake in Kaga City, in the western part of Ishikawa Prefecture, central Honshu (main island), Japan. The Lake is surrounded by forested hills and rice fields. The Sea of Japan lies beyond the hill in the northwest of the Lake. The Lake is a wintering sites of the largest numbers of White-fronted Goose and Middendorf's Bean Goose in the western Japan. The Lake is designated to a Ramsar Site in 1993, as well as a Natural Monument of the Prefecture (1969), the First Class Special Area of Quasi-National Park "Echizen Kaga-kaigan Kokutei-koen" (1993), Special Area of National Wildlife Protection Area "Katano-kamoke" (1993). An observatory, "Kaga City Kamoike Sanctuary" was built in 1984 by the City Government beside the Lake for the purpose of environment education, where the staffs of Wild Bird Society of Japan have been engaged in it. It has had about 30,000 visitors a year. They can make observations of wildlife and habitats using spotting scopes settled in the observatory and also learn with videos and displayed materials. A committee for the conservation of the Lake has been established since the designation to a Ramsar Site, where relevant organisations, governmental, non-governmental and from local communities in the area, holds regular meetings four times a year, with discussions and/or inspection visits to other sites, towards wise use of the Lake. It has been a forerunning effort in the country. Such a committee has been found in a limited number of other sites. It is hoped to be a good model. Introduction by (former) Division of Life and Environment, Kaga City Government. 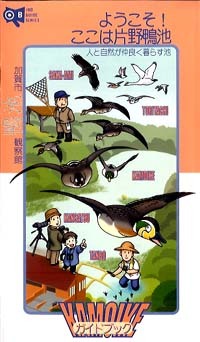 Ramsar database sheet for Katano Kamoike, A Directory of Wetlands of International Importance, Wetlands International. Annotated Ramsar List of Wetlands of International Importance in Japan, Ramsar Bureau. 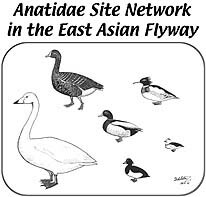 The "Action Plan for the Conservation of Migratory Anatidae in the East Asian Flyway" is a component of the "Asia-Pacific Migratory Waterbird Conservation Strategy", and the "Anatidae Site Network in the East Asian Flyway" is a programme of international co-operation to enhance the conservation of the wetlands of international importance for Anatidae (ducks, geese and swans) in the flyway under the "Action Plan". The "Anatidae Working Group" of Asia-Pacific Migratory Waterbird Conservation Committee oversees the implementation of these programmes with technical support from Anatidae Flyway Officer. For further information, please contact the Anatidae Flyway Officer. Posted 14 May 1999, updated 20 February 2005.